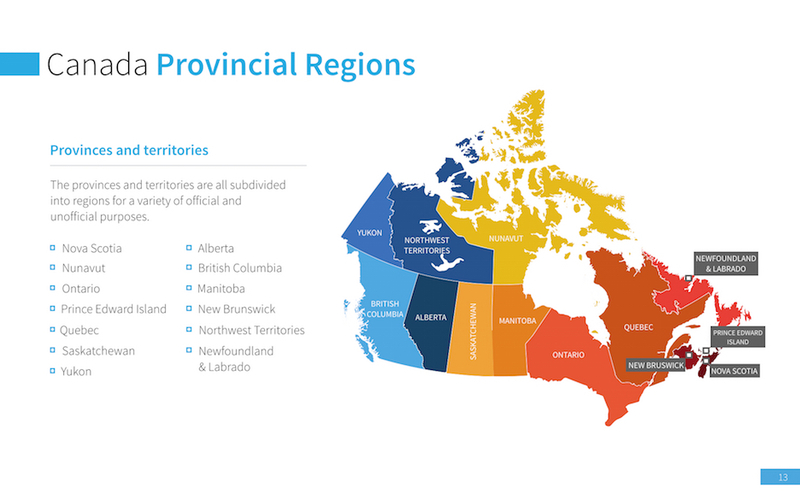 Featuring a variety of maps of Canada, this template features a variety of maps of Canada that show the whole country and others that highlight specific provinces. Breaking down results by geographic region is helpful when making tough decisions. The maps make it easy to visually share your results with others. With 43 fully customizable slides, the template features maps of Canada that range from showing the entire country to individual provinces. From pointing out where Canada is in the world to focusing on Newfoundland & Labrado, the template covers Canada in its entirety. In addition, 21 Canadian/global themed vector icons are included for your use. Easily change their color and size to complement your presentation. 43 unique presentation slides designed by professionals that you can easily edit and fill out with your personal content. 21 icons are used in this template which you can flawlessly move, resize or change colors throughout your presentation slides. What's included in Canada Map Presentation Template?